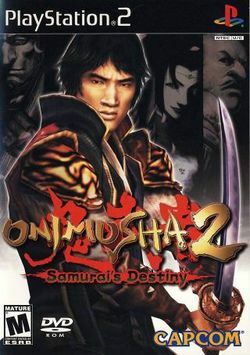 Onimusha 2: Samurai's Destiny, released in Japan as Onimusha 2 (鬼武者2, Onimusha Tsū?) is the second installment in the Onimusha series of video games. The plot revolves around a new protagonist, Jubei Yagyu (柳生 十兵衛, Yagyū Jūbē? ), as he battles a demonic Genma army which is invading 1571 Japan. Nobunaga Oda, a sinister warlord who was slain in the previous game, has been resurrected and placed at the head of the Genma forces. Apart from the main character, the game features four playable sub-characters, each of whom shares a part in the story. The player's actions determine which characters will decide to help Jubei in his quest. The Jubei character is not the swordsman Yagyū Jūbei Mitsuyoshi, but rather his grandfather, Yagyū Muneyoshi, the originator of the Yagyū Shinkage-ryū school of swordsmanship.